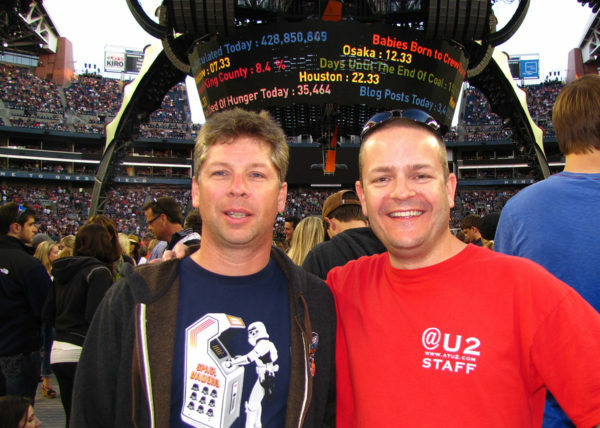 Danny and I at the U2 360 concert in Seattle, June 2011. If you’ve been around the search industry long enough, you have a Danny Sullivan story. He’s touched and impacted so many people in the 21 years he’s been covering search — a career that is coming to a close with his announcement this week that he’s stepping away from being Chief Content Officer at Third Door Media (the company where I’ve worked since 2008) into an advisory role. That news has prompted an incredible — and well-deserved — outpouring of congratulations and memories from people around the world, and not just people in the search industry. In early 2006, I was working for a company here in the Tri-Cities that offered web hosting, web design and SEO/online marketing (all of which I’d learned from reading Danny’s Search Engine Watch site). I started my own SEO blog and was active in some SEO forums, and made a couple cool connections with important people that way … but no one would’ve been able to pick me out in a police lineup. I’d never been to any of the SEO/online marketing conferences. I didn’t have any big-name clients that would put me on anyone’s radar. And, as an extreme introvert, I wasn’t exactly going out of my way to change any of this. I had good clients and good co-workers, did good work and was quite satisfied with things. Danny and his SEW team held a couple Search Engine Strategies (SES) conferences each year in the SF Bay area, Chicago and New York City, none of which I could afford to attend. Then they announced an inexpensive, one-day workshop in Seattle that I could afford. That was in May of 2006. I drove over, attended and enjoyed the workshop and was ready to head home at the end of the day. And that’s when things changed. On my way out of the hotel lobby (Hotel Monaco if you need to know), I saw Danny standing alone off to the side of the front desk area. He was reading a newspaper, as I recall. (The iPhone didn’t exist yet!) I stepped completely out of character and decided to go say hello. I thanked Danny for bringing an event to the Pacific Northwest. We talked about the bigger conferences his team did each year. I asked him if they’d ever consider doing sessions that are specific to small/local businesses. We had a very enjoyable (at least for me) conversation that must’ve lasted 10 minutes. Let’s get something straight right now: In 2006, Danny Sullivan spending 10 minutes in solo conversation with me would be like Bono spending 10 minutes discussing songwriting with a dude from some local garage band. But that’s what he did. And it kinda changed everything, at least for me. Three months later, I found myself speaking at my first SES conference — it was a session about small business SEO, exactly what we’d spoken about in the hotel lobby. How cool is that? That led to my new job with a big digital marketing company in Seattle, where I worked half the month from home and half the month in Seattle. My salary doubled with this new job. I did consulting for the likes of Target and The Weather Channel, among others. I spoke again a few months later at SES Chicago, and at more conferences after that. Then in 2007, I started contributing content to Danny’s new site, Search Engine Land, as a columnist about small business SEO. And in 2008, I officially joined the team as Assistant News Editor (or something like that). Since then, I’ve worked my way up with new responsibilities and have been Editor-In-Chief of Search Engine Land, Marketing Land and MarTech Today since 2013. All because Danny was willing to give me 10 minutes of his time at the end of a long conference day. And what I’ve learned in all the years since that conversation is that, as great as Danny’s industry contributions and accomplishments are, he’s an even better person. And that’s really remarkable. Thanks for everything, Danny. You’ll be missed. But I’m super happy for you and excited to see what you’ll be doing next. Godspeed.